Entire hillsides are transformed into fields of gold during the height of wildflower season at this state park on the Washington side of the Gorge, just across from The Dalles. Access into this paradise requires a Discovery Pass for $10 per day or $30 per year (they can be bought at the trailhead). Camping is possible as well. To enjoy this epic display of wildflowers in April and May, there are two options. The easiest is to start at the upper trailhead, near the original Crawford Ranch on Dalles Mountain Road at a paved trailhead. From here, you can hike the spectacular lower meadows on trails like the Vista Loop and 8 Mile Alternate for 2 to 3 miles. These were in full bloom during my trip, so thick with balsamroot and lupine that the air was perfumed. Later in the season, as the bloom moves up the mountain, you can hike uphill toward Stacker Butte from the same trailhead. A final option is to begin at the lowest trailhead, the Crawford Oak Trailhead, and hike uphill past a nice waterfall and into the wildflowers. This is steeper, and there weren't many wildflower blooms until you reached the meadows, but it's hard to complain when the views are this good. Directions (Crawford Ranch Trailhead, Upper): From I-84 near The Dalles, take exit 87 and turn left on Highway 197 and the Columbia River on a bridge. Drive 3 miles to Highway 14 and turn right. Go half a mile and turn left up Dalles Mountain Road. Continue 3.7 miles on the gravel road, passing the Crawford Ranch, to a well-signed trailhead and parking area. Of all the hikes on the list, this one is my personal favorite. The Catherine Creek area on the Washington side of the Gorge is spectacular in so many ways. The towering basalt formations and canyons, old homesteads, views of Mount Hood and the smell of ponderosa make me want to stay for days rather than hours. The Arch Rock Loop is the best easy hike here and requires a bit of navigation. The loop is 2.1 miles with 481 feet of climb. 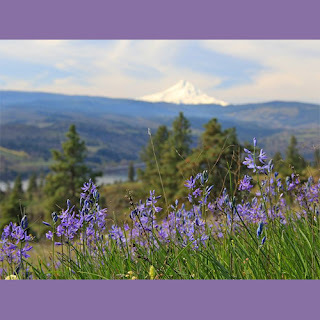 From the trailhead, the route follows a combination of trails and closed roads past a rock arch, a bubbling creek, an old homestead, epic views of the canyon and Mount Hood, along with more types of wildflower than you can count. The best time to hike is March to May. 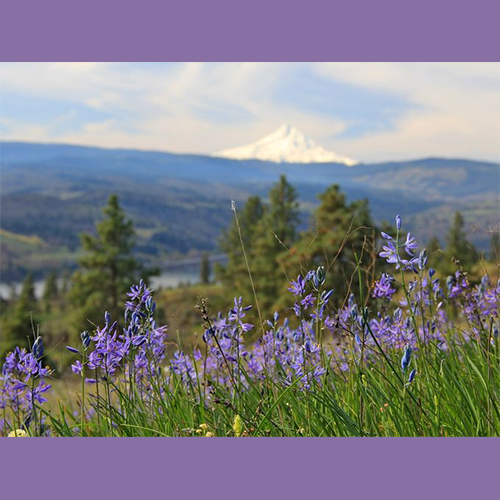 Right now, the bloom is excellent, with camas lilies, balsamroot, lupine, prairie stars and many others. Truth be told, the top three wildflower hikes starting here really stood out above the others. They were all spectacular in their own way, and ranking them was a challenge. All three are must-hikes. It wouldn't be quite right to call Memaloose Hills a secret — it appears in a book and a handful of websites — but it's still unmarked and less traveled than most wildflower hotspots in the Gorge. The trail begins at Memaloose Viewpoint, just across the highway. It's unmarked throughout but easy to follow a total of 2.2 miles and 629 feet to the top of Marsh Hill. Balsamroot blankets the entire hillside at the top with a touch of lupine, and views extend to Mount Hood. The trail winds through oak savanna where other wildflowers stand out, including blue-eyed mary, gold star, larkspur and many others. Apparently there are longer options, but I didn't hike them. Directions: From I-84 near Hood River, take Exit 69 and continue on the Historic Columbia River Highway 30 east through the town of Mosier. In a little more than 3 miles, stop at the Memaloose Viewpoint. The trail begins just across the road. Two different hikes begin at this popular viewpoint on the Historic Columbia River Highway. The easier of the two traverses the flat Rowena Crest in the Tom McCall Nature Preserve in a landscape carved by ancient lava flows and floods. Dogs are not allowed on this 2.5-mile out-and-back hike, and there isn't any shade at the trailhead, so leave Fido at home for this trek. The views are almost nonstop from the beginning of this hike, and in April and May, balsamroot and lupine are the highlight. Excellent views down onto the Columbia can be had at viewpoints along the trail. If you're seeking a more challenging hike, the trail to Tom McCall Point leaves from the same trailhead and shoots uphill 1,070 feet on a hike of 5 miles round-trip (the trail is currently closed at the 0.6 mile mark for reconstruction, but many reopen soon). Balsamroot and lupine also highlight this trail, along with desert parsley. And the view of Mount Adams and Hood at the top are memorable. Directions: From I-84 near Hood River, take Exit 69 into Mosier and continue on the Historic Columbia River Highway 30 east through the town. In 6.6 miles, you will see the Rowena Crest Viewpoint parking area on your right. Both trails start here. This hike is on the steep end of "easy," but it's very pretty, and the fact that it starts right within the wonderful town of Mosier is a bonus. The Mosier Plateau Trail climbs 600 feet and travels 3.5 miles round-trip, heading through a park, following a creek, passing a waterfall and ending on a plateau with beautiful Gorge views. Peak wildflower season is normally mid to late April (but it's early this year). The ubiquitous balsamroot is the star of the show, but the hike also feature buttercups, blue-eyed mary and others. Directions: From I-84 near Hood River, take Exit 69 toward Mosier. Head south off the exit and head into the town of Mosier. Park at the totem pole in town or at a gravel pullout. The trailhead is on the south side of Historic Highway 30, just over the historic bridge. You'll see a bench just after crossing the bridge and a trail. This is the beginning of the hike.